I seem to be looking at a lot of space-based stuff lately. Maybe I'm unconsciously searching for new subject matter, or maybe it's just that there's been a huge number of amazing new discoveries. There's evidence that Titan's hydrocarbon seas may have hydrocarbon icebergs floating on them, for instance, and three-dimensional imaging of weather patterns in a brown dwarf with the catchy name 2MASSJ22282889-431026: wind-driven layered clouds 'composed of hot grains of sand, liquid drops of iron, and other exotic compounds.' And astronomers have discovered an incredibly old star just 190 light years away: with an age of at least 13.2 billion years old, HD 140283 is only slightly younger than the universe, but because it possesses small amounts of heavy elements it is probably a second-generation star (only hydrogen and helium formed immediately after the Big Bang; all other elements heavier than iron were created by supernovae). Meanwhile, Cassini scientists list their top ten discoveries in and around Saturn and its rings and moons, in 2012. As Kevin Kelly observed in a recent thought-piece, thanks to the panopticon of phone cameras and the internet, the improbable is becoming the new normal. Kelly, ever the optimistic, thinks this will change us in interesting ways; web pioneer Jaron Lanier thinks the whole Web 2.0 thing may have been a terrible mistake. Even though it links you, instantly, to stuff like this - 2001: A Space Odyssey comics, with space squids. 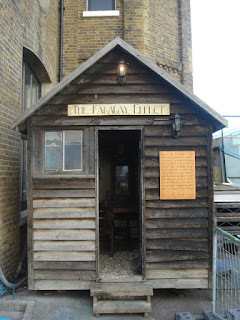 I'm a sucker for little museums, and this has to be one of the smallest, a tribute to Michael Faraday housed in a garden shed. It can be found at Trinity Buoy Wharf, the site of London's only working lighthouse, formerly the site of workshops where shipping buoys were repaired. Sited in Tower Hamlets, where Bow Creek debouches into the Thames, it's one of those odd, overlooked corners of London that isn't on the way to anywhere else. The wharf has been made over into an art quarter, and despite the corporate-bohemian feel (that web site, plaques overexplaining the 'heritage', a visitors' centre), the area is a nice mix of industrial activity and Victorian decay. 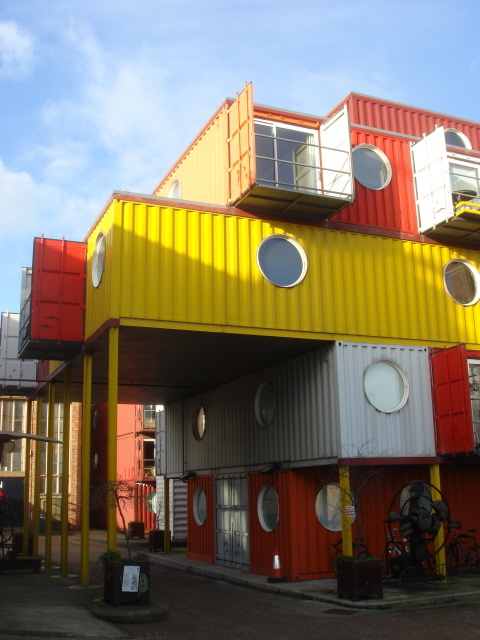 There are workshops, studios housed in repurposed shipping containers, an American diner (closed, darn it, when I visited on the Sunday between Christmas and New Year's Day), and the Longplayer installation. Composed by Jem Finer for Tibetan singing bowls, the Longplayer is designed to play for a thousand years (it started on January 1st, 2000). There's a listening post up in the old lighthouse, which gives lovely views across the river; I was inspired then and there to write a short story about a similar installation orbiting inside Saturn's rings. But to the end of his days, he could not explain the affair of the white boat. Very pleased to report that I have just received a contract from Gollancz for a reprint omnibus of my far -future science fiction trilogy, Confluence. The three novels (Child of the River, Ancients of Days, Shrine of Stars) were published way way back at the end of the last century, and went out of print fairly quickly. Now they're coming back as a big omnibus edition (1100 manuscript pages, 360,000 words), with two related stories as bonus material. Right now, I'm re-formatting and copy-editing ancient text files in a long-dead version of WordPerfect. The book should be out in December this year. ﻿Here they come! Here come our new neighbours! They’re so close now that if you went outside and stood on the shell of our garden, you would be able to see them without enhancement: six sparks of fusion flame, six ships killing their velocity as they make their final approach to our home. Our new neighbours, come to visit in quaint old ships, lumpy cylinders equipped with so-called anti-proton ‘fast-fusion’ drives. And as their ships approach our home, our ships approach theirs, which is also naked-eye visible. You see? That faint fleck about twenty-eight degrees antispinward of Jupiter’s cold brilliant star. It’s an old place, their home, an old way station constructed by Earth’s European Union four centuries ago. It looks like a sea creature from Earth – a sea urchin. You see? At the heart of that cluster of spikes, pointing in all directions, is a small stony rock. The spikes are cylindrical habitats, what they call skyscrapers, on Earth. They are linked by a web of cableways and tubes, and those lights in their casings, they’re windows. Inside the spikes, the skyscrapers, are divided into hundreds of rooms. I know. It is a strange way to live. We’d find those skyscrapers cramped and claustrophobic: the rooms are small, and not every room has a window. And yes, I know, our new neighbours look strange, too: small, compact, golden-furred. But we must look strange to them – long and skinny, mostly bald, mostly pale-skinned – and they’ll find our garden strange and unsettling, too. Imagine being used to living in a crowded maze of little spaces, little rooms, and finding yourself inside a spherical room twenty kilometres across, with a layered shell of foamed diamond-fullerene composite and water, and all green inside, raft forests and airkelp clouds and secondary spheres two or three hundred metres across arrayed around a little central sea and lit by chandelier clusters. They’ll think our lovely bubble fragile and overwhelmingly empty, and they won’t be able to swoop and glide through its airy volumes; they’ll cling to the towns strung along the struts. We’ll have to be kind and patient, even though we have so much to show them, so much to celebrate, so much to talk about, and so little time. There are more than ten thousand gardens and habitats like ours, constructed from materials mined from rocks and comets. There are more than a million and a half rocks with a diameter of more than a kilometre, and about one per cent of them are permanently inhabited. That’s a lot of cities and settlements, yes, but the Belt is a big place, a toroidal volume of 6 x 10 to the power of 24 cubic kilometres. On average, rocks and gardens are about a million kilometres from their nearest neighbour, and most of their nearest neighbours are either barren or are not much more than pebbles or boulders, too small to ever be colonised. But everything in the Belt is moving in different orbits around the sun, at different speeds. Everything is constantly changing its position relative to everything. And whenever a garden or an inhabited rock crosses our sky close enough to reach with minimal expenditure of reaction mass, we like to visit our new neighbours. It doesn’t happen very often – after all, this is the first conjunction since you were born – and that’s why it’s important, and exciting. Yes, of course we’ve already talked to them. We already know a lot about them. They’re very eager to talk about their work, even though we don’t understand much of it. The geometries of manifolds; theoretical work on wormholes, those fabulously impossible dreams of rapid-transit systems between worlds and stars. They are posthuman and scrupulously rational, with minds as hard and spiky as their home; we’re dreamers, gardeners, experts in the malleable possibilities of the so-called soft sciences. But there’s much we have in common. We’re all from the same stock, human and posthuman. And it’s good to be reminded of how much we have in common with people who seem utterly unlike us. Everyone agrees this is a Golden Age, four hundred years of peace and prosperity, four hundred years since the last big war, when certain powers from Earth attempted to impose their authority on the cities and settlements of the moons of Jupiter and Saturn. Oh, I know there’s conflict. This is a golden age, but it isn’t a utopia. It’s vital, ever-evolving, struggling in a thousand different directions towards a thousand different ideals. There are plenty of arguments and disagreements in our great and variegated human family, and sometimes disagreement flares into brief conflict, and there are civil wars, too, one family toppling another, scions fighting parents, the rising generation struggling to escape to influence of its elders. But there aren’t any big conflicts, and in the past four centuries no single ideology has attempted to use violence to stamp its imprint on history. Trade is one of the big reasons for peace. And so are visits like this. Visits from new, temporary neighbours. They send visitors to us; we send visitors to them. Yes, I’ve heard that a few cynics call it an exchange of hostages, but it’s really a cultural meiosis. Here they come, swinging down the sun’s gravity well in their funny old ships! There will be scientific and philosophical talkfests, poetry olympics, concerts, and games of all kinds. There will be commerce and romance and intrigue – even espionage, a game with rules and penalties thousands of years old. Information will be exchanged; new ideas may be born from fusion of our different traditions; techniques considered trivial by one party may kickstart an artistic or industrial revolution in the other. Who knows what will happen? We will dance with our new neighbours, and when we separate we will begin to discover how we have been changed. Here they come!